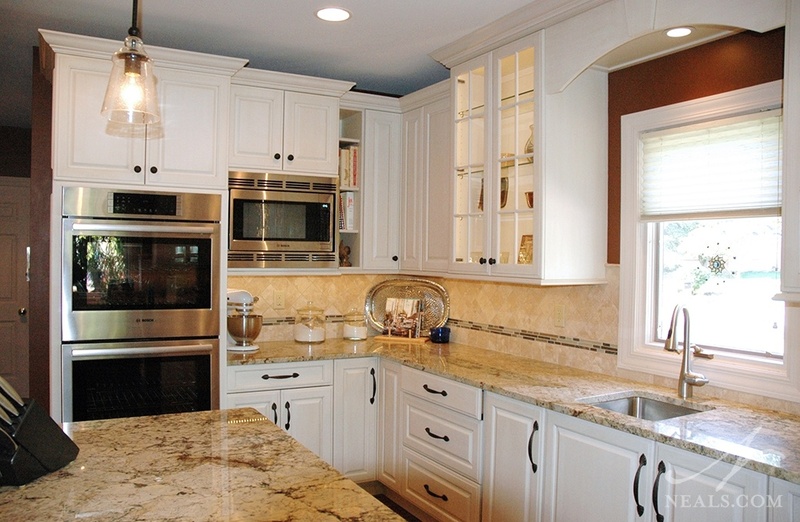 If you’re planning to remodel your kitchen it’s important to find the right fit when choosing appliances. The space of your kitchen will be the key factor. A typical kitchen is about 200-square-feet. In some kitchen remodels, physical barriers such as existing walls may dictate the size of appliances that can be accommodated. In other remodels where barriers aren’t an issue, you may have complete freedom in selecting appliances and adapt your kitchen design to the models you select. Top Freezer. Capacity 10-to-22 cubic feet, width 23-to-36 inches, depth 27-to-33 inches, height 60-to-69 inches. Bottom Freezer. Capacity 18-to-25 cubic feet, width 29 -to-36 inches, depth 28-to-33 inches, height 67-to-70 inches. Side-By-Side. Capacity 20-to-28 cubic feet, width 28-to-34 inches, depth 28-to-34 inches, height 66-to-69 inches. French Door. Capacity 20-to-25 cubic feet, width 32-to-36 inches, depth 28-to-36 inches, height 68-to-70 inches. Counter Depth. Capacity 15-to-25 cubic feet, width 32-to-36 inches, depth 24-to-26 inches, height 68-to-71 inches. 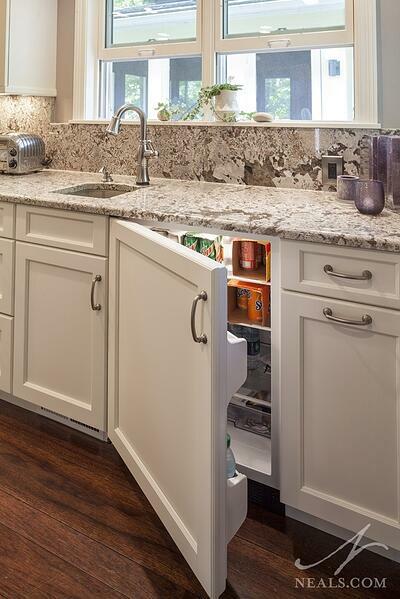 Built-in refrigerators can be single units or modular. Modular fridges give you the opportunity to customize not only how much fridge and freezer storage you have, but also to place the modular pieces where it makes the most sense to. For example, the freezer unit can be placed outside of the working triangle near the pantry, and the fridge unit can be placed in the work triangle near your prep counter. Stoves come in a variety of sizes and widths depending on the number of ovens and burners and the type of backsplash installed on the stove. 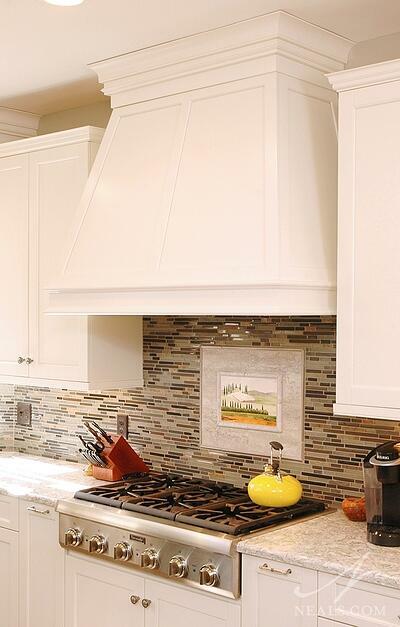 Manufacturers have begun removing the stove backsplash and placing the controls at the front, allowing homeowners to install decorative tile backsplashes. The result is cleaner lines around the room, making the kitchen look larger. Most stoves are 47- 48 inches high, as measured from the floor to the top of the backsplash. The height from the floor to the top of the cooking surface is 36 inches and the depth averages between 24-to-26 inches. The dimensions of a standard 4-burner, single oven, free-standing range are 30 inches wide, 25 inches deep and 47 inches in height. The cutout height for the range is 36 inches and 30 inches to allow for the width. For the ultimate cooking center, with a full-size convection oven, a steam/convection oven, and a slow cook/warming oven, look for one of the two 48" wide gourmet ranges on the market. Dual fuel ranges use both gas and electricity to cook. The cooktop is powered by gas to enable a cook to control the flame when heating food. The oven is electric and maintains a constant temperature when food is baked. The standard sizes for a cooktop are 30 inches and 36 inches. Induction cooktops are gaining popularity because they are a safe efficient way to cook. An induction cooktop heats the cooking vessel and not the surface glass. It takes less time to cook or boil water. Wolf makes a two-burner 15-inch induction cooktop that is a good fit on a small island or counter surface. Vent hoods come in many styles. 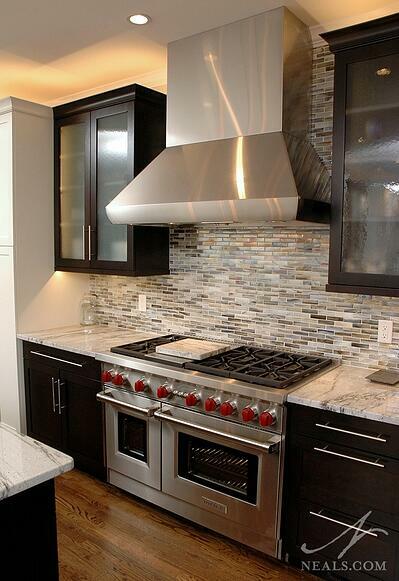 The key to choosing the right hood for your stove or cooktop is the heat output of the unit. Heat output is measured in BTUs (British Thermal Units. Vent hoods have a fan that pulls air to the outside of your home. The airflow capacity of a vent is measured by CFM (Cubic Feet per Minute). These two factors are used to identify vent hoods that will be efficient. The Home Ventilation Institute recommends dividing the BTU rating of your stove or cooktop by 100 to determine the CFM needed. Across the country, building codes are increasingly demanding that a make-up air damper be installed if a hood moves over a certain CFM rating. These CFM values vary per state, and country, and may require additional expense in your project. 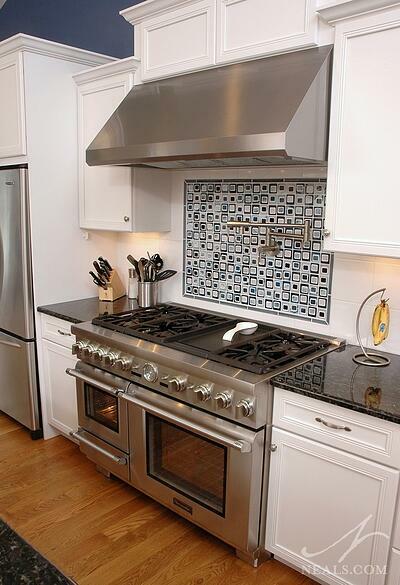 The Home Ventilation Institute also considers the width and placement of a range or cooktop in determining hood size. If the stove is placed against a wall, you should allow 100 CFM per linear foot of the range. A 30-inch or 36-inch range would require a vent rated at 300 CFM or greater. A cooktop on an island would require 150 CFM per linear foot. Whether single or double, gas, electric or convection wall ovens come in 24, 27 and 30-inch widths. Single wall ovens have a capacity that ranges from approximately 2.7-to-4.4 cubic feet, are 24 inches deep and 28 inches tall. 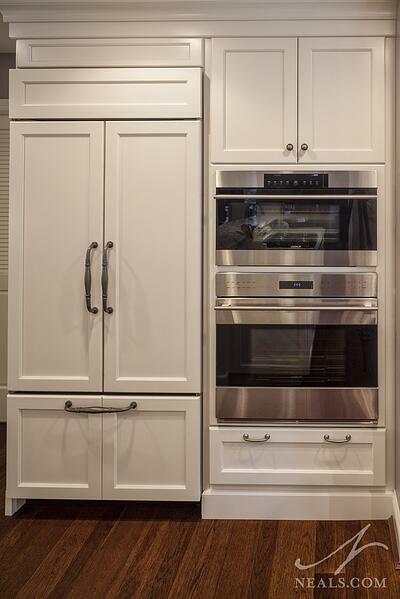 Popular models of double ovens are 51-to-52 inches tall and 23-to-26 inches deep. There are also combinations available if you are restricted in the size of your kitchen and want to keep both units in the same oven cabinet. These are oven/microwave, oven/speed cook, and oven/steam/convection combinations that will all fit in a standard 24" deep oven cabinet. Countertop. Countertop models range from 0.7-to-2 cubic feet in capacity, 17-to-24 inches in width, 10-to-14 inches in height and 12.5-to-20 inches in depth. If you will be converting a countertop model to a built-in, you will need a trim kit to install it correctly. Built-In. Built-in microwave ovens range from 1.1-to-2.0 cubic feet in capacity. There are three width sizes: 24, 27 and 30 inches. Height ranges for 19-to-22 inches and depth 15-to-24 inches. 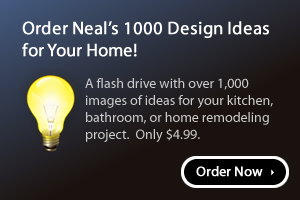 Built-in models typically come with everything you need to install it properly. Over-the-Range. Over-the-range microwave ovens have a fan for venting. These ovens are generally not as efficient as range hoods for ventilation, particularly for a gas range with high heat output. Their capacity is 1.4-to-2 cubic feet, width ranges from 21-to-30 inches, depth 13-to-16 inches and height from 14-to-19 inches. Microwave Oven Drawers. 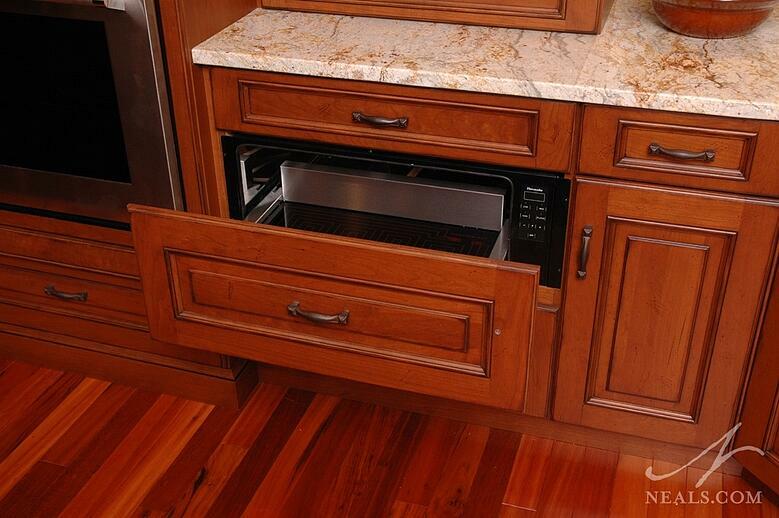 Microwave oven drawers can be installed under a counter, on an island or under a wall oven. The capacity ranges from 1-to-1.2 cubic feet. Microwave oven drawers are available in widths of 24 and 30 inches. Height is 15-to-16 inches and depth 24-to-25 inches. Warming drawers come in four widths: 24, 27, 30 and 36 inches. The height generally ranges between 10-and-12 inches and the depth is 24 inches. 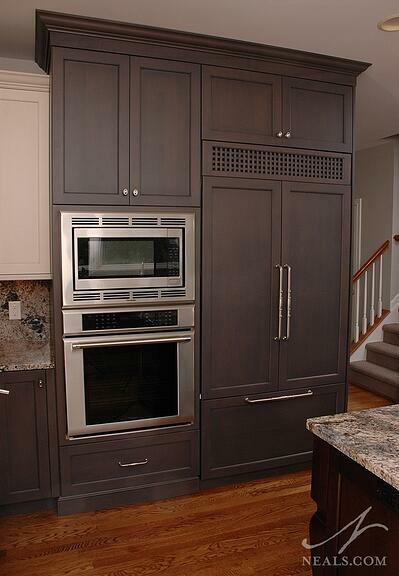 Since the warming drawer temperature is low, it is possible to use a custom panel to blend it into the cabinetry. Many of the new dishwashers you will find on the market have microprocessor-controlled sensors that allow you to adjust the duration of a wash cycle. 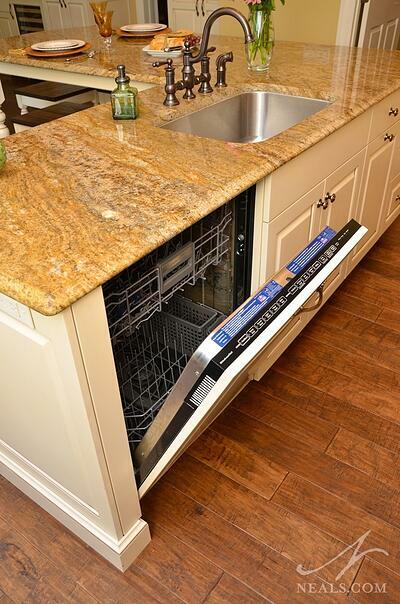 A standard built-in dishwasher is approximately 24-to-30 inches wide, 25 inches deep and 35 inches in height. The average size of a drawer dishwasher is 23.5 inches wide, 22.5 inches deep and 16 inches high. Under-counter refrigerators have the capacity of 6 cubic feet, are 34 inches tall, 23-to-24 inches deep and 15, 18 or 24 inches wide. They can be solid door or glass door, and in either case, you can substitute the stainless steel, white or black finish with a custom wood panel or frame. Refrigerator drawers are also available, typically as a stacked pair. There are wine coolers on the market that will store as few as 6 bottles and more than 200 bottles. In most kitchens, under-counter wine refrigerators are used and capacity ranges from 30-to-60 bottles. Wine refrigerators within this range are 15-to-24 inches in width, 23-to-25 inches deep and 34 inches tall. 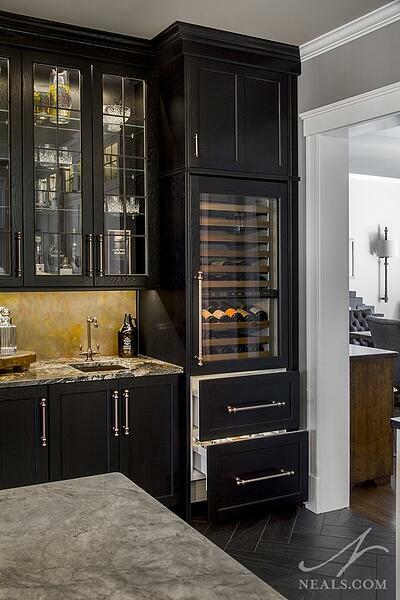 For the true wine enthusiast, there are tall column wine refrigerators available. These models are 80 to 84 inches tall, and can be installed flush to cabinet doors. They come in stainless steel and glass finish, or can be covered with a custom wood frame. Quality wine storage units offer two or more temperature zones to store different wines and offer UV protection and anti-vibration qualities to keep your wine at peak flavor for a longer time. When shopping for appliances, look for the ENERGY STAR label that indicates the appliance is more energy efficient than the minimum standard specified by regulation. ENERGY STAR rated appliances include dishwashers, freezers and refrigerators. Some popular appliance brands include: KitchenAid, Sub-Zero/Wolf, Viking, Thermador, Bosch, GE Café and GE Profile products. Many of these appliances can be fitted with custom cabinet doors to create a uniform look in a kitchen. It’s always helpful to work with a kitchen designer who can assist you in finding the best products for your project.